Jesus . . . came to the tomb. 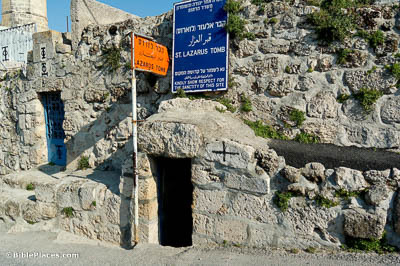 It was a cave, and a stone lay against it (John 11:38). The traditional tomb of Lazarus has gone through so many alterations over the centuries that it’s hard to get a sense of what it looked like originally. This entrance isn’t even the original one—it was carved out by the Franciscans in the 16th century after the first entrance became blocked by a mosque. 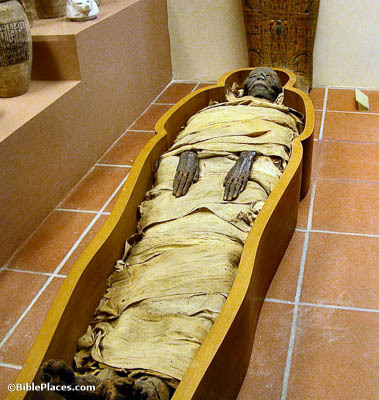 Fortunately, the original antechamber and burial chamber are still accessible. The man who had died came out, bound hand and foot with wrappings (John 11:44). Lazarus had evidently been wrapped up almost mummy-like in preparation for burial. This wouldn’t be too helpful in the process of escaping his own tomb, but the fact that he could make it to the entrance under such restrictions only proves the power of Jesus’s miracle; Lazarus was not only resuscitated, but returned to full strength. The Romans will come and take away both our place and our nation (John 11:48). The Jewish leaders thought that if Jesus became too popular, the Romans would respond with military action and remove them from power. And while they were wrong about the reason, they were right to fear this; that exact thing happened a few decades later, in AD 70. The Romans laid siege to Jerusalem, and once they breached the walls, they utterly destroyed the temple, carrying off the sacred objects as spoil—effectively ending the sacrificial system and orphaning the priests involved. 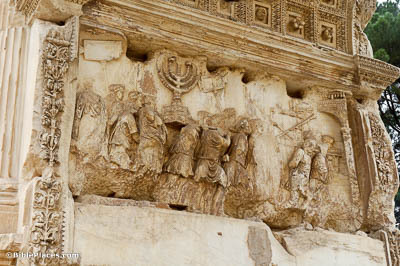 This relief, etched into the Arch of Titus in Rome, memorializes this event. That He might also gather together into one the children of God who are scattered abroad (John 11:52). The death of Jesus, as unintentionally prophesied by Caiaphas, led to the formation of a body of Christ-followers in Israel and around the world. Jewish people were exiled all over the place in the Roman world; and while most of them rejected Christ, some embraced him and were joined together with Gentiles in the church. 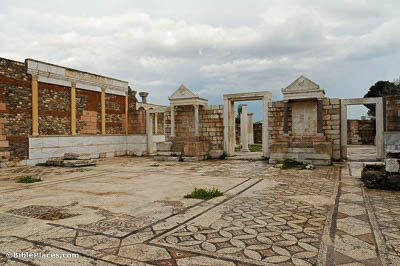 This 4th-century synagogue was found in Sardis, a city which hosted one such group of Jewish and Gentile believers (Revelation 3:1-6). Jesus . . . departed from there into the region near the wilderness, to a town called Ephraim (John 11:54). Because the Jewish leaders were beginning to threaten Jesus in earnest, he decided to retreat to a more remote area. It’s likely that the modern village of Taybeh can be identified as Ephraim, as well as the Old Testament village of Ophrah. 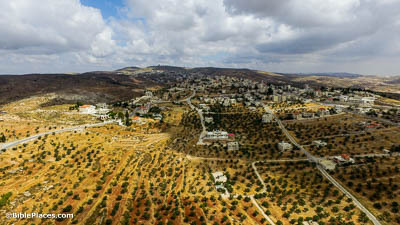 About 20 miles (32 km) north of Jerusalem, Taybeh is a quiet place, removed from denser civilization—which makes it an ideal place to retreat from a calculated plot against your life. 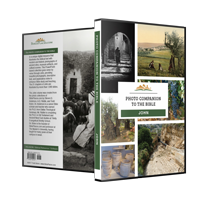 Many went up from the countryside to Jerusalem before the Passover, to purify themselves (John 11:55). The washing of hands is a traditional part of the Passover observance, but for those in Jerusalem when the temple was still standing, the purification was a bit more involved. Pilgrims were required to immerse themselves in a ritual bath, also called a mikveh. 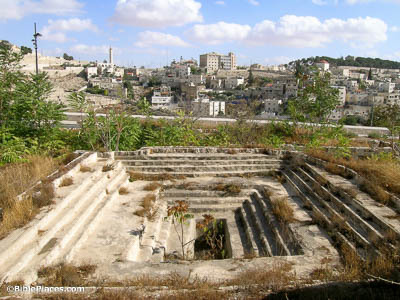 This bath found south of the Temple Mount is quite unusual in its size and shape, with stairs on all four sides. This may have served to accommodate some of the crowds mentioned in this verse.